Many people with obesity face infertility issues and seek infertility treatment or procedures. A recent article linked Vitamin D status to improved success rate of IVF (in-vito fertilization) & ICSI (interacytoplasmic sperm injection) in The Journal of Maternal-Fetal & Neonatal Medicine. It is important to check Vitamin D status for infertility treatment. Of the 252 females that completed the ICSI cycle, 42% became pregnant (n = 108). The mean vitamin D status was significantly higher in the pregnant group compared to the non-pregnant group (17.74 ng/ml vs 9 ng/ml, respectively; p = < 0.01). Vitamin D status was positively associated with both pregnancy (p = 0.001) and endometrial thickness (p < 0.01). Higher vitamin D levels was associated with a 21% increase odds of clinical pregnancy (p < 0.05). Following weight loss surgery (WLS) there can be improvement of fertility and for that reason we recommend two forms of birth control methods during the first 18-24 months following WLS or until weight loss has stabilized for several months. This helps to ensure the best outcome and health for the mother and infant. In our office we continue to stress the importance of Vitamin D3 for bone and dental health, pregnancy, breastfeeding and several auto-immune diseases. Vitamin D has also been shown to reduce pre-term birth Duodenal Switch patients require a dry water miscible form of Vitamin D3 due to the fat malabsorption of the DS procedure. There are several past blog posts on the topic of Vitamin D and it’s associated nutrients. Vitamins are organic, essential nutrients that are necessary to keep your body in good health. Most vitamins must be obtained through diet because they cannot be synthesized in the body. However, the human body is able to make its own vitamin D in the skin through sun exposure or it can be obtained by food and supplements of Vitamin D3. Vitamin D is a fat-soluble vitamin that is responsible for regulating muscle contraction, immune function, bone health, and intestinal absorption of magnesium, calcium, phosphate, iron, and zinc. Good sources of Vitamin D include sun exposure, dairy products, fatty fish, fortified orange juice, cod liver oil, mushrooms, and supplements. There are two types of Vitamin D: D2 (ergocalciferol) and D3 (cholecalciferol). Both types have the same mechanism of action, but different sources and kinetics. Ergocalciferol is easily obtained through Vitamin D-rich foods in normal anatomy. However, a post Duodenal Switch patient will have less absorption of Vitamin D via food due to fat malabsorption. Ergocalciferol is hydroxylated to ercalcidiol [25(OH)D2] in the liver. Its second hydroxylation takes places in the kidney, where it is converted to the active form of Vitamin D2 known as ercalcitriol [1,25(OH)2D2]. Now in it’s active form, Vitamin D2 can bind to the Vitamin D receptor (VDR) and help the body where it’s needed. In the epidermis of the skin, precursor 7-dehydrocholesterol (7-DHC) forms cholecalciferol as a result of UVB radiation. Several factors such as increased skin pigmentation, age, and sunscreen application reduce the skin’s production of choleciferol (6). 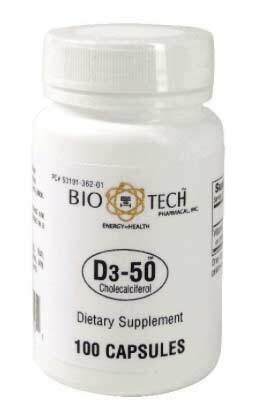 Cholecalciferol is hydroxylated in the liver to become calcidiol [25(OH)D3]. It is then moved to the kidney for further hydroxylation to Vitamin D3’s active form known as calcitriol [1,25(OH)2D3], also called calcifediol. The active form allows binding to VDR for biological activity. Both forms of Vitamin D have been shown to effectively increase 25(OH)D levels. Research shows that after administering a single dose of 50,000 international units (IU) Vitamin D2 or D3, both experienced a similar increase in serum 25(OH)D concentration. However, Vitamin D2 levels rapidly declined while Vitamin D3 levels remained high (1). Further studies have confirmed that Vitamin D3 is more effective in elevating and maintaining 25(OH)D levels for a longer amount of time (5). Scientists believe the most reasonable explanation for Vitamin D3’s substantial efficacy is its higher affinity to metabolites, which results in a longer circulating half-life than Vitamin D2 making it more potent(4). For a post Duodenal Switch patient, due to fat malabsorption, it is important to use “Dry” Water Miscible form of Vitamin D3. A 25-hydroxy Vitamin D blood test is the most accurate way to measure levels. A level between 20 ng/mL-50 ng/mL may be considered sufficient, however in our bariatric practice we would like to keep the levels in 60-80 ng/mL. It is worth nothing that recently the reference ranges was increase to 30-100 ng/mL. Treatments of Vitamin D deficiency include frequent sun exposure, fortified foods, supplements, and injectables. in addition to 50000IU of vitamin D on daily basis in emulsified (water soluble) formulary or unto 600,000IU in injection form. The parallel guide for adequate vitamin D supplementation is normalization of PTH levels. Monitoring these levels is imperative in a post bariatric patient. In conclusion, studies have shown that Vitamin D2 and D3 are not interchangeable. Although they have comparable absorption, Vitamin D2 has a shorter duration of action which makes it less potent than Vitamin D3. Researchers have shown that neither form is harmful to treat Vitamin D deficiency, but they should not be considered bio-equivalent. 1. Armas LAG, Hollis BW, Heaney RP. Vitamin D2 is much less effective than Vitamin D3 in humans. Journal of Clinical Endocrinology & Metabolism. 2004; 89(11) 5387-5391. 2. Creighton D, Ignaszewski A, Francis G. Vitamin D: new d-fence against cardiovascular disease. BCMJ. 2012; 54(3) 136-140. 3. Holick MF, Schnoes HK, DeLuca HF. Identification of 1,25-Dihydroxycholecalciferol, a form of Vitamin D3 metabolically active in the intestine. PNAS. 1971; 68(4) 803-804. 4. Hollis BW. Comparison of equilibrium and disequilibrium assay conditions for ergocalciferol, cholecalciferol and their major metabolites. J Steroid Biochem. 1984; 21(1) 81-86. 5. Houghton LA, Vieth R. The case against ergocalciferol (Vitamin D2) as a vitamin supplement. Am J Clin Nutr. 2006; 84 (4): 694-697. 6. Howick Mf, Binkley NC, Bischoff-Ferrari HA, Gordon CM, Hanley DA, Heaney RP, Murad MH, Weaver CM. Evaluation, treatment and prevention of Vitamin D deficiency: an Endocrine Society clinical practice guideline. J Clin Endocrinol Metab. 2011; 96(7) 1911-1930. 7. Johal M, Levin A. Vitamin D and Parathyroid Hormone in general populations: understandings in 2009 and applications to chronic kidney disease. CJASN. 2009; 4(9) 1508-1514. 8. Tetley EA, Brule D, Cheney MC, Davis Cd, Esslingen KA, Fischer PWF, Friedl KE, Green-Finestone LA, Guenther PM, Klurfeld DM, L’Abbe MR, McMurry KY, Starke-Reed PE, Trumbo PR. Dietary reference intakes for Vitamin D: justification for a review of the 1997 values. Am J Clin Nutr. 2009; 89(3) 719-727. 9. Tripkovic L, Lambert H, Hard K, Smith CP, Bucca G, Penson S, Chope G, Hypponen E, Berry J, Vieth R, Lanham-New S. Comparison of Vitamin D2 and Vitamin D3 supplementation in raising serum 25-hydroxyvitamin D status: a systematic review and meta-analysis. Am J Clin Nutr. 2012; 95(6) 1357-1364.